It's time for a Christmas review, and in the season of short days and long nights, what's more appropriate than Dublin's newest gastropub? I'd been hearing quiet words about this new dining venture for the past few months, with the doors to the East Side Tavern finally opening in late November. The interior at Easat Side Taven (formerly the Tavern on the Green) has undergone a seismic shift. An eye-catching backlit tiered bar showcases an extensive collection of whiskeys and other spirits, while blackboards list a selection of cocktails and drinks. The atmosphere here is casual comfort with leather upholstered seats, exposed brickwork and a roaring fire in the open fireplace. Decor accents are provided by brass pieces and salvaged timber, making the interior feel both extremely contemporary and aged. Whoever was responsible for the design and fit out got this one spot on. Niall O'Sullivan (formerly of Isabel's) is the Head Chef in the kitchen, and the menu bears his distinctive stamp. I dined twice during the month of December, once off the Express Lunch menu, while my other visit was from the a la carte lunch menu. I love the concept of the Express Lunch which offers two courses for €14 (or €16 with dessert). It's a great option for a business lunch or catchup with friends. After all, there are more than enough offices with well-paid workers in the vicinity to sustain this concept. The Express Lunch starters are a choice of soup or salad, each of which changes regularly and is served quickly, while the main courses are delivered from the kitchen when ready. In our case, soup was a smooth butternut squash soup, with a salad of beetroot, whipped goats cheese and leaves. The portions aren't huge, but really, they're meant to satisfy you while waiting for the main course. Slow braised should of lamb ragu was served in a light broth with pillowy gnocchi and parmesan shavings. Beer battered fresh cod was served on a board, along with a freeform log pile of crispy triple cooked chips, tartar sauce and a delectable frozen pea mousse. On another visit, I chose the Fish of the Day, which was chargrilled salmon with Jerusalem artichoke risotto. I love it when salmon is served with a crispy skin, as was the case here, but the artichoke risotto was the true star on the plate. The earthy sweetness of the artichoke, along with naturally sweet parsnip crisps combined so well with the burnt notes of the chargrilled salmon. Dessert was a set custard flavoured with woodruff (also knowns as Wild Baby's Breath), imparting a sweet almost perfumed note. Apple sorbet and sorrel granita provided balance and crisp textures to the luxurious custard. Obviously the East Side Tavern works really well as a restaurant, but how does it fare as a pub? Maybe it was the Christmas decorations and the warm lighting, but I didn't want to leave after our Express Lunch. Instead I wanted to settle in for the afternoon,with some nice drinks and company, and watch the daylight fade to winter dusk. For me, the East Side Tavern feels like the next evolution of the gastropub, smoothly combining the relaxed atmosphere of a pub with the refined food of a fine restaurant. Are you ready to cross over to the East Side? 2014 is nearly over, and as part of the mini-habit I've established on this blog, I've assembled a list of the most-read posts.It's an interesting list, offering an insight into what is popular right now. Interestingly, all the Top 10 posts come from Dublin and all feature recent, or relatively recent restaurants. There's a good mix of styles, ranging from fine dining (The Hot Stove), French-influence (Brioche) to burgers (Bunsen) and Asian (Opium). It clearly shows that Dublin diners are an eclectic lot but with a constant finger on the pulse. It's amusing to think that Bear, the restaurant from Joe Macken and Jamie Heaslip which is just under 3 years old, is now the grand-daddy of the group. Brioche sits in a lovely red-brick building just off the main street of Ranelagh. Inside, Gavin McDonagh creates beautiful French-inspired tasting plates that showcase the best of Irish ingredients. The front of house restaurant space in the Westbury has been remodeled into Balfes, featuring an attractive outside terrace and a Josper Grill in the kitchen. Perfect for people watching in the middle of the city. Hot Stove Restaurant has been open on Parnell Square for nearly 2 years now, and has firmly established itself as a high quality and good value fine dining spot. It's a great option for pre-theatre dinner or a special occasion. Super Miss Sue will shortly celebrate her first birthday, but even in that short time, SMS has become a fixture at the bottom of Drury Street. Fresh seafood, a top notch chipper and now a charcoal-grill "pop-down" in the basement. I may not like the tunes at Opium, but there's no denying that the food and cocktails at this fashionable bar restaurant are damn tasty. Keep an eye on their Twitter account for special deals and offers. Ever since it opened, Bunsen has been recognised as the spot for the best burgers in town. With a simple menu that literally fits onto the back of a business card, it's still the best spot for a beefy fix. Salt Lick is the semi-permanent pop-up brainchild of Brian McCarthy and William Toft. Every Friday & Saturday, they take over the kitchen at Hobart's Cafe in Ranelagh. With a menu that changes on a monthly basis and house-made cocktails using BYO bottles, there's always something to enjoy. I first visited Bear nearly three years ago, making it the longest established restaurant on this list. But clearly its popularity still hasn't waned one iota. The cocktail scene is definitely exploding in Dublin right now, with many high quality venues. But it's definitely been a great year for Kevin Hurley and the team at the Liquor Rooms, achieving a first nomination for Ireland at the prestigious Tales of the Cocktail Spirited Awards and 4 awards at the inaugural Irish Craft Cocktail Awards. Looking at the statistics from Google Analytics, there's no doubt that 2014 belonged to Pizza e Porchetta. I recently returned for a pre-theatre dinner and was once again impressed by the modern Italian food from Ronan Ryan and Pat Lalor, plus we all got to laugh at one of the funnier TripAdvisor reviews. Cocktail bars are springing into existence everywhere at the moment. If you listen carefully, you can hear the gentle shakey-shakey* sound of a new bar being born, complete with waistcoated bartenders and artistically arranged gin bottles. One of the latest bars to pop into being is Bar Rustic (by Dylan McGrath), located directly above his popular Rustic Stone restaurant. The decor is an extension of the restaurant downstairs and is immediately comfortable. Think wooden floors and black quilted leather seats with matching bolsters. There is an attractive back-lit tiered arrangement of bottles behind the bar, while cocktails are listed on retro letter boards as well as printed menu cards. I've always loved the wide range of bold, strong flavours used by McGrath throughout his restaurants, so I was expecting to find similar influences on the cocktail menu. There are many promising flavour combinations, such as a mango & tarragon smash or a lemongrass sidecar, and I was looking forward to sampling. Our first round involved an Irish Honey for me (rhubarb liqueur, Glendalough Poitín, honey syrup, marmalade and lemon) and a JR Sour for him (a classic sour made with Jameson and flavoured with rosemary). Overall, I liked the use of Glendalough poitín in the Irish Honey, but it was was a little on the sweet side for my taste. The JR sour was well-made with an attractive foam cap, but ultimately it lacked the promised rosemary note. Second round was a Thyme for Tequila (a thyme flavoured Margarita) and a Lemongrass Sidecar. The margarita was robust with a definite thyme kick. Tequila can take herby flavours quite well, and I definitely liked this combination. On the other hand, the delicate flavour of lemongrass was lost in the sidecar, which is a classic combination of brandy, lemon and orange liqueur. Overall, I really liked the atmosphere and style of Bar Rustic. The room is welcoming and would be even more attractive at nighttime, with gentle lighting inside and the street lights outside. With some good background music (not the generic beat stuff that was playing on our visit), this room could be an instant classic. It's got a great location, bang in the middle of town and the menu definitely has enough variety to warrant a few visits. We used a voucher from TheTaste.ie, which offered us 4 cocktails for €20. Without this voucher, the cocktails would have cost approximately €40, which is pretty much the going rate for cocktails at the moment. *For those of you who don't know what I mean by shakey-shakey, let me tell you that it is simply the best sound in the world. All the ingredients have been placed in the shaker, ice has been added and the tin has been closed with a solid tap. The bartender picks up the closed shaker, adopts their preferred stance and starts to shake. Inside the tin, all the ice is banging around, mixing the ingredients, bruising any leaves or fruit present and adding a little dilution. Shakey shaky is part of the magic of cocktail making. This week's post isn't really a review but a brief run down of my recent dinner at Pomona Pop Up restaurant which took place over the October Bank Holiday weekend. Chefs Jason Walsh (L'Ecrivain) and Lumir Tousek (former head chef at L'Ecrivain) served up an impressive ten courses at their two day event on Thomas Street. At €80 per head, it wasn't exactly cheap, but the professionalism of the staff, lovely venue and generous meal did much to make it feel like good value. Thomas Street cafe, The Food Gallery, with its lovely high ceilings and classic parquet floor was converted into a white linen fine dining establishment. I received a warm welcome and exchanged my bottle of Pouilly Fumé for a glass of prosecco. Wine was BYOB with no corkage, which meant that there was a wild and wonderful selection of alcohol throughout the room. Pictures of the courses follow below. Beautiful modern presentation, featuring colour and texture, combined with clever use of seasonal, local ingredients and quirky touches was the order of the night. I loved additions such as fermented oats, roasted egg white and malt. Stand out items for me were the foie gras macaron, the hen's egg dish, the crispy skinned sea bass and the rich gnocchi. As I was sitting at a table for one, I received a whole bottle of the lovely Highbank Proper Dry Cider as a precursor to the dessert courses. Such generosity was hardly required after most of a bottle of wine, but it was definitely liked. Right now, I don't think there are any future plans to repeat Pomona Pop-Up but follow them on Twitter (@PomonaPopup) or on Facebook for updates. It's always exciting when a new lunch spot opens near the office. But, the initial novelty of something different lasts only so long, and then it's back to the humdrum. However, with the opening of Sister Sadie on Harrington Street (in the site of the former Tiesan cafe), I don't think there's going to be any ennui anytime soon.. Sister Sadie comes from the people behind the acclaimed Brother Hubbard (Capel Street), who currently hold the title of Best Sandwich in Dublin, awarded by McKennas' Guides for their pulled pork creation. The cafe is set back a little from the street, with room for outdoor seating in finer weather. On the day of my visit, autumn was definitely in the air, with golden leaves swirling on the ground. Inside, the style is clean and bright with simple square wooden tables and bench tables along the window. Sister Sadie serves breakfast until 11.30ish (taken from their menu), after which it switches to lunch service. The team have continued to work with their established Brother Hubbard suppliers for their new menu. Soups, salads, flatbreads and of course sandwiches all feature with a definite Middle Eastern flavour going on. Most dishes come with a side portion of one of their homemade salads, making each plate a substantial affair. Cannellini beans in a thick, lightly spiced tomato sauce came with pulled pork and a soft fried egg (€9.95). A gentle citrus note added some zing to the sauce, partnered by a little scattering of sumac across the top. The pulled pork was top notch, not too soft or wet and based on this, it's easy to see why the Brother Hubbard sandwich has won the accolades. 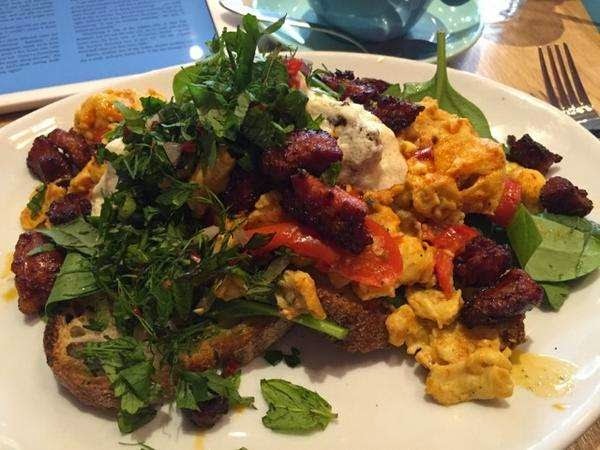 The Brother Hubbard Turkish Eggs Menemen is another favourite transported from Capel Street. Slices of toast were piled high with eggs scrambled with tomato and red peppers, dressed with black olive and feta yogurt (€9.95). A generous garnish of fresh chopped herbs added many different flavours, although I personally could do with the parsley. However, given the prominence of parsley in Middle Eastern cooking, I suspect my hate/hate relationship with this obnoxious green herb will continue. Chunks of pan-fried chorizo (€2.95 extra) added meaty, spiciness richness. A wheat-free coconut and lime bun was dense but really moist, and topped with the most delicious, creamy, smooth icing that I can recall. A perfect tea-time treat. Sister Sadie is open from 7.45am to 5pm Monday to Friday, and there are plans for weekend brunch soon. The new location is sure to be a winner with potential to catch both the office crowd and the local residents. This winning mix of healthy, tasty food, coffee and sweet treats is bound to be as popular on the southside as it has been on the northside.